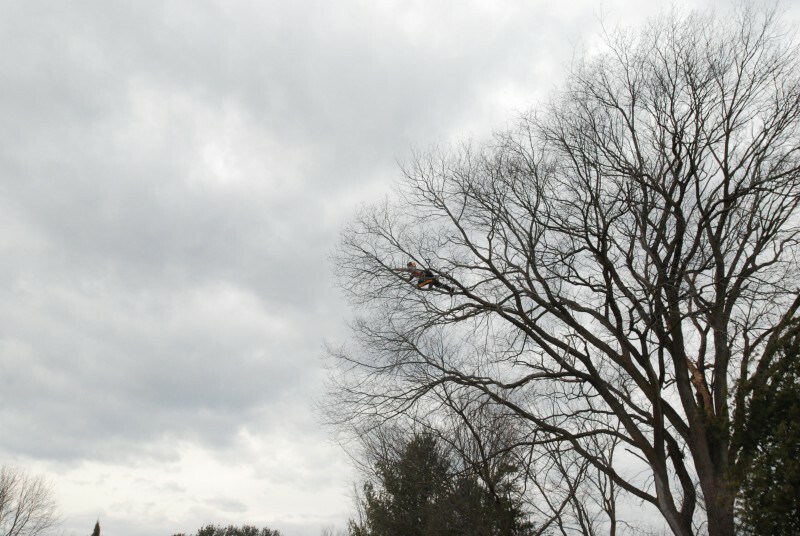 An arborist harvests flower buds from an American elm in Charlotte, Vermont. Photo credit: Gus Goodwin, The Nature Conservancy. The flower buds from Mrs. Waters’ elm tree are 35,000 feet up in the stratosphere on an express flight to Ohio. The goal is to get them there before they dry up. When they arrive, scientists will lay them on wax paper, collect their pollen as it falls from the stamens, and use it to hand-pollinate the flowers of Ohio elms that are receptive and waiting in the lab. 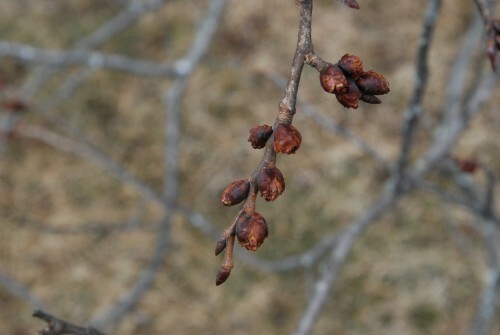 These buds may be the key to restoring the American elm to dominance in the floodplain forests of the Eastern United States, a focal project of The Nature Conservancy (TNC) and floodplain ecologist Christian Marks. The buds’ progenitor, a four-foot diameter American elm in Charlotte, Vermont, named Henrietta, has beat the odds. Located merely a stone’s throw from four other elms, all of which have succumbed to Dutch elm disease (DED), Henrietta is noticeably larger and healthier. Though she (also a he—American elms bear “perfect” flowers, with both male and female parts) has signs of DED on two branches, the remainder of the tree is healthy enough to produce flowering buds, a luxury that the sick elms around it cannot afford. Normally, trees exposed to DED die within a year of exposure[i]. That this one has not– and that it continues to flower—suggests it may possess some degree of resistance. After scientists cross-pollinate the Vermont and Ohio elms, they will tend the branches until they set seed. When the seeds mature into small, wafer-like samaras, evolved for wind dispersal, the Ohio scientists will airmail them back to Marks (wind dispersal by mechanized means) who will then grow them to seedlings and plant them in one of TNC’s floodplain forest restoration preserves. But that’s not all. What’s to say those young seedlings won’t succumb to the same fate as their not-so-fortunate relatives? For Marks to know that Henrietta is a stalwart, he must subject her offspring to a potentially fatal injection of DED when they reach one inch in diameter. Though it will be some time before we find out if Henrietta is truly resistant, the offspring of buds collected from other trees in 2011 and 2012 are approaching the requisite diameter for testing. And while “absolute resistance” is the stuff of science fiction, previous studies conducted through Guelph University in Canada found a heightened level of resistance in 25% of lab-pollinated offspring reared from large, healthy elms[ii]. Marks is hopeful for a similar (or better) result from his Vermont/Ohio crosses, which were selected not only for their size, but also for their proximity to elms that have succumbed to DED. If Marks and his colleagues succeed in cultivating a DED-resistant American elm, this stately canopy tree may eventually be restored to its position in the highest strata of the floodplain forests in the Eastern United States and Canada. And though we may not be alive to see it regain canopy dominance, we can celebrate that the elm’s capacity for water uptake may reduce the severity of future flooding events, bald eagles may return to nest in its branches, and our children will once again walk to school beneath trees for which many American streets were named. Perhaps this dream begins with the plump red buds bound – at this moment – for Ohio. American elm flower buds. Photo credit: Gus Goodwin, TNC. [i], [ii] Christian Marks, personal communication, 9 March 2016. Hannah Phillips is a first-year graduate student in the Ecological Planning Program. She is grateful to Christian Marks, Gus Goodwin, and The Nature Conservancy-Vermont, for welcoming her on this outing, to Mrs. Waters for offering samples from her tree, and to Chea Waters Evans for cleverly naming the tree Henrietta (after Henrietta Lacks). Here in Vermont, the passage of fall foliage marks the arrival of stick season. For a smaller group of birding enthusiasts, it also marks the triumphant return of the snow geese. 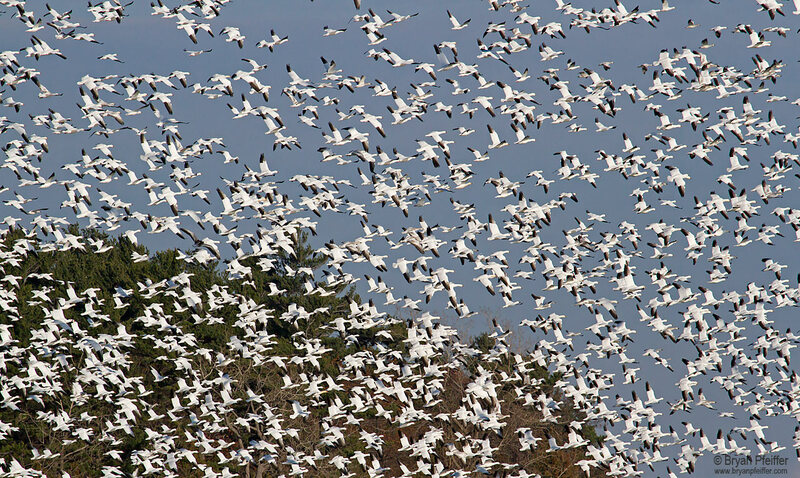 Every year, thousands of snow geese descend upon the Dead Creek Wildlife Refuge in Addison, seeking respite and fuel on their journey south from the Canadian arctic to the mid-Atlantic coast. This year, though, things might look a bit different. As celebrated as their arrival is in Vermont, snow geese are anything but rare. In fact, they have the distinction of being one of the most abundant waterfowl in North America[i]. Once they arrive here in Vermont, they’ll chow voraciously on the region’s finest assortment of grass and sedge roots. Or, at least they used to. Murmurs in the birding community suggest snow geese dietary preferences are changing, and their migratory patterns are changing to follow their taste buds. This change in forage is purely out of necessity. Populations have increased dramatically over the last one hundred years, the result of a hunting ban imposed in 1916 to allow a dwindling population to rebound[ii]. And rebound they did. Although hunting reopened in 1975, snow geese are now so plentiful that food is proving hard to come by; they must find food, or they’ll starve. So, what’s on the menu? Agricultural plant remains – the most abundant food around. Some geese have become so reliant on agricultural fields for food that they are now adjusting their migratory routes to stopover in prime farmland. Despite plentiful agriculture in Vermont’s Champlain Valley, our forage is proving inferior to that in New York. Here, nearby farmers typically harvest their corn for cow silage, which leaves little waste material left for munching. Across the lake in New York, farmers often harvest corn as a commodity, leaving the stalks behind[iii]. As a result, the number of geese visiting Dead Creek each year has declined dramatically. In 2005, ten thousand snow geese stopped over; in 2006, that number dropped to five thousand[iv]. Since then, number have held steady at three to five thousand each year, with around two thousand geese already reported for this fall[v]. 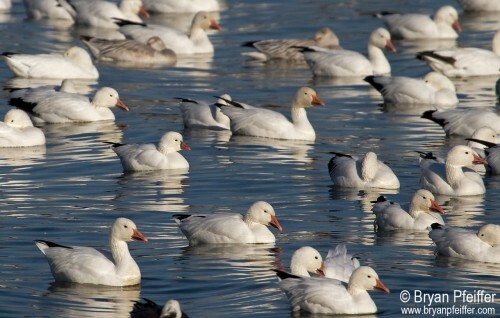 A Ross’s goose sits amidst snow geese in Lake Champlain in 2013. Is the geese’s absence necessarily concerning? If you’re one of the many visitors who make the annual trip to Dead Creek adorned with binoculars, puffy coats and neck warmers, their absence may make you feel as empty as Thanksgiving spent without the chattering, bickering, well-loved guests. And, if you’re a wildlife biologist, keeping the wildlife management area an attractive stopover spot for geese helps minimize damage to neighbors’ crops, increases public interest in wildlife and increases the potential for hunting (another solution to limit population growth). There is incentive to keep the birds close. Snow goose biologists have planned for just this scenario[vi]. What to do if the snow geese disappear: plant crops to lure them back to Addison. Vermont officials have already converted upland portions of Dead Creek to agricultural fields featuring a rotating crop of corn and hay, although the geese have yet to find it[vii]. It’s a crop artillery race against New York, and the winner is by no means fixed. While a visit to Dead Creek this fall may not yield the same giddying barrage of honking that it has in past years, that doesn’t mean they’re gone for good. If you’re in need of a weekend excursion, hop in your car, drive down to Route 17 in Addison, and train your eyes to the sky. Bring a snow-globe for good luck – perhaps a good shake will prompt a flock of one thousand geese to flutter through the clouds in the first big snowstorm of fall. Hannah Phillips is a first year student in the Ecological Planning Program. [ii] Mowbray, T. B., Cooke, F., & Ganter, B. (2012). [iii] Alfieri, A. Personal Communication, Vermont Department of Fish and Wildlife. (2015, October 26). [iv] Alfieri, A. (2015, October 26). [v] Pfeiffer, B. (2015, October 25). “The 2015 Snow Goose Scoop.” Retrieved from http://bryanpfeiffer.com/the-snow-goose-scoop/. [vii] Alfierio, A. (2015, October 26).